One of the things that comes with the system, taped onto the side of the system a very important note. 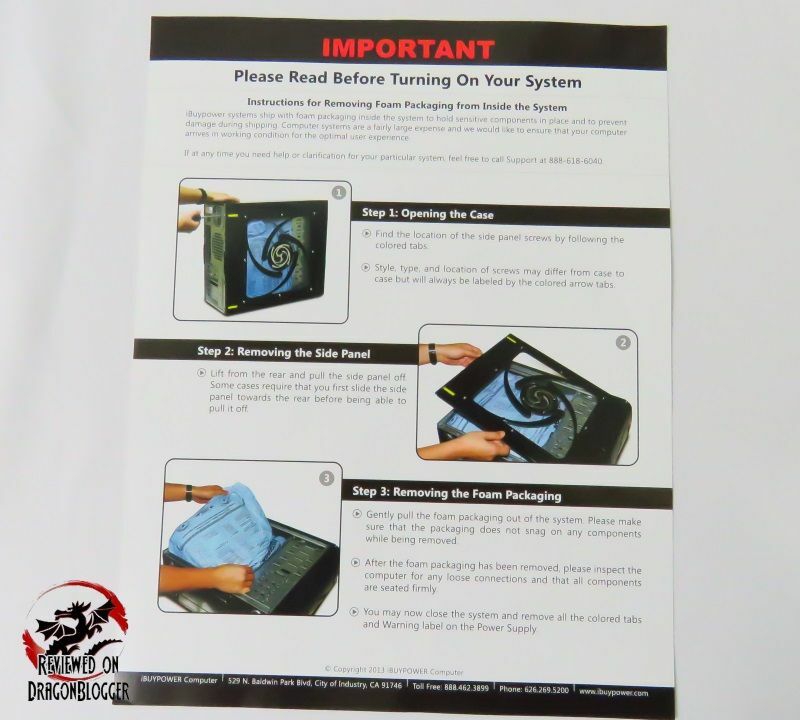 This note is to remind you to remove the foam they included inside of the machine to make sure nothing comes loose during shipping and destroys the inside of the machine. I have seen this many times before, and it’s horrible what can happen, especially if the liquid cooling unit gets damaged. You don’t want to turn on the system with that inside. 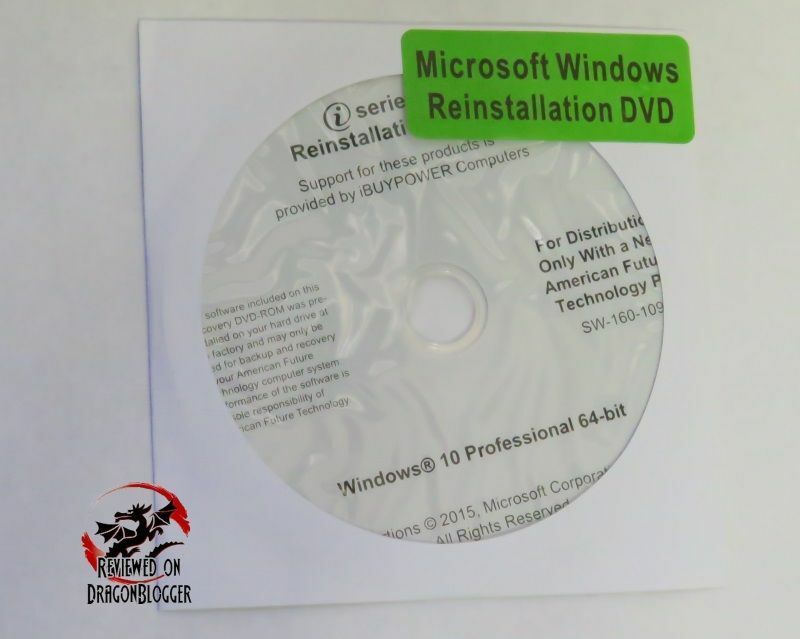 The system brings a Windows 10 reinstallation DVD, which is a bit awkward considering the system does not bring an optical drive. In case you end up getting this system, click on the link so that you can check out an affordable LG 8X USB 2.0 DVDRW drive. You have already seen the outside of this machine, but I will show you one more time just in case you forgot. 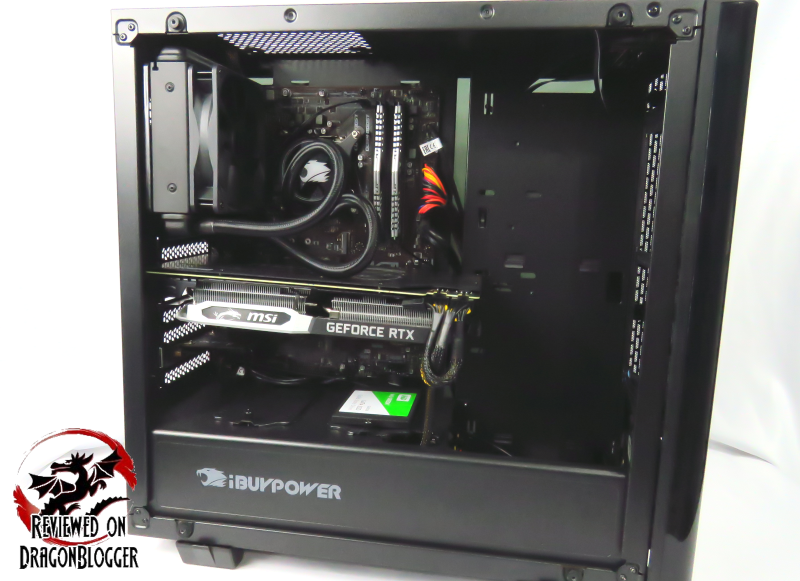 The case is a iBUYPOWER branded Thermaltake View 21 case, made just for iBuyPower. It’s a nice case with a curved front face and the only thing that sets this aside from the regular View 21 is the logo on the power supply shroud and on the top portion of the case which we will see a bit later. Without the glass side panel one, which each side has, you can see inside of the case. 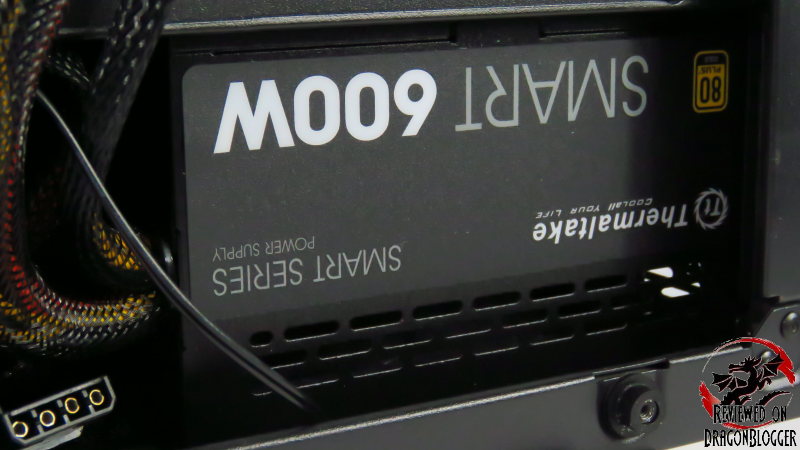 Just above the power supply shroud, you can install 2 x 2.5’ drives, in this case there is already a drive installed. 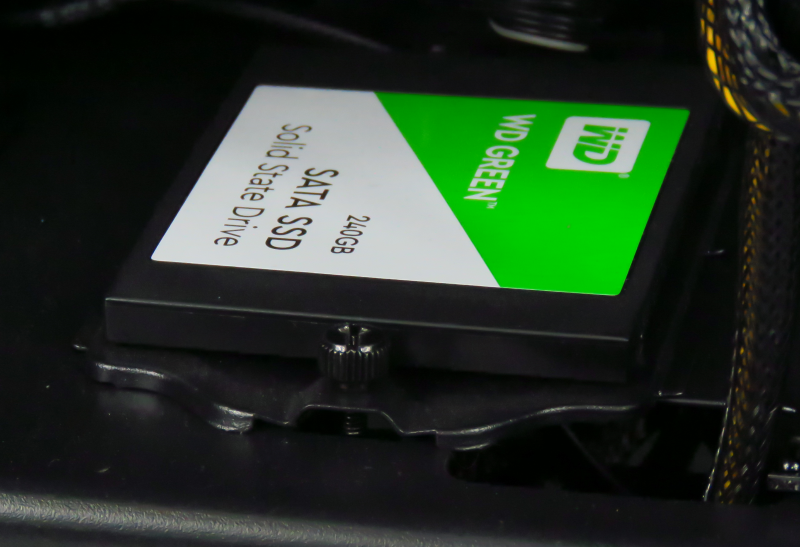 The drive is a WD Green 240GB SSD, this is where Windows 10 Home gets installed onto, for a bit of a performance boost over standard slower mechanical drives. Just above that, we find the system includes a WiFi card. The card is held in a M.2 adapter card making it compatible with the system. 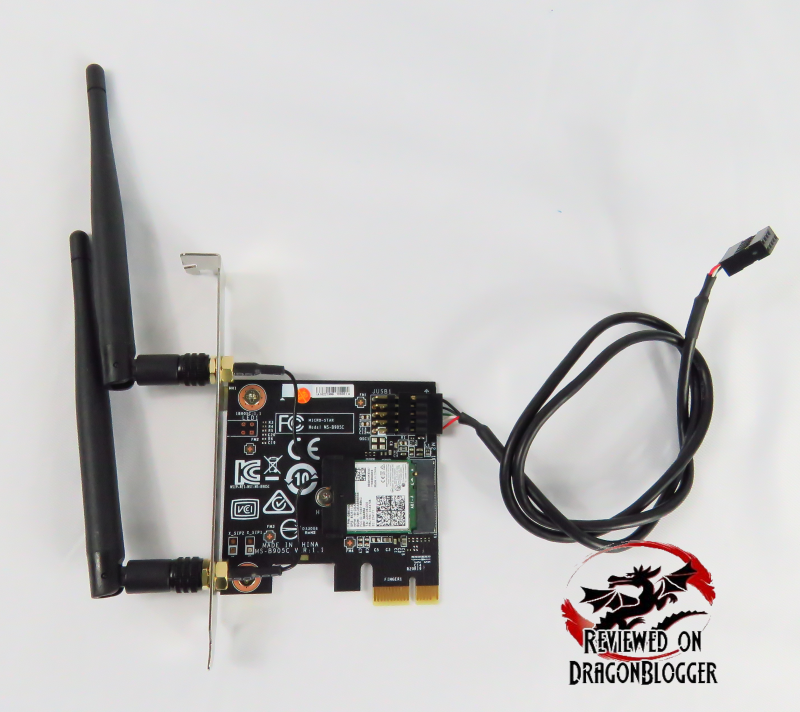 The card itself is an Intel Dual Band Wirelss-AC 3168 so not only does it have dual band WiFi but it also has Bluetooth. 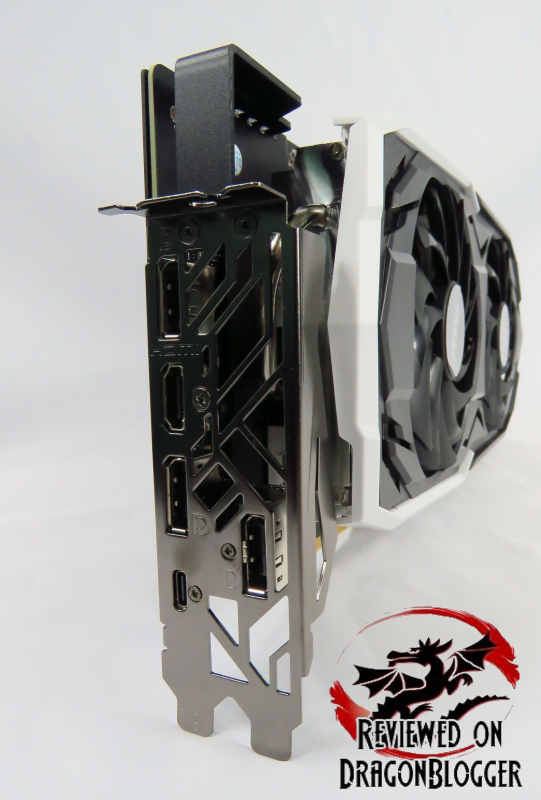 The card not only takes up a x1 PCI-e slot, but it also uses up a USB 2.0 header. While this may not seem like much for some, others don’t have an option and need Wi-Fi where their desks are and being that this comes with a pre-built machine that you don’t need to wait around to get built, this is a plus. 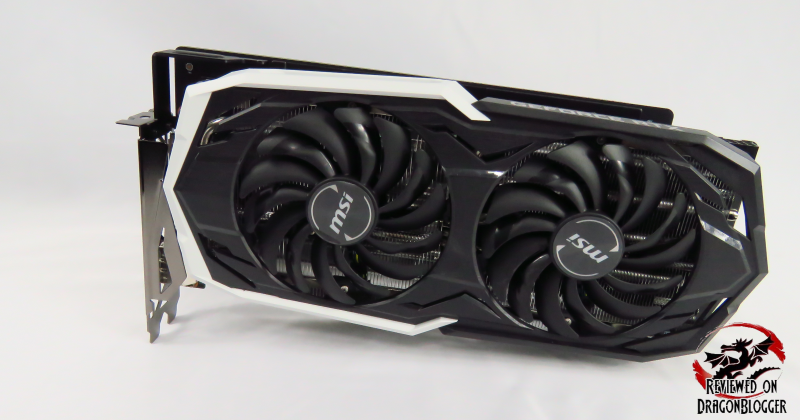 Above the Wi-Fi card, we find an MSI Ventus Geforce RTX 2070 8G, a great card for the price, on its own it is a good card which is kept pretty cool in this system. The card provides 2 x HDMI, 2 x DisplayPort and a USB-C connection. 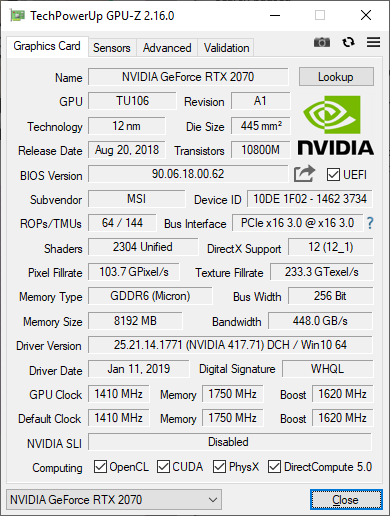 Prior to running GPU-Z, I thought it was a higher end card, the ARMOR series, but I corrected the text afterwards… making the benchmarking results a little more enticing. 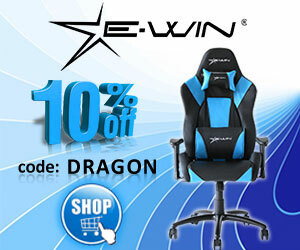 Just above that, we find an iBUYPOWER liquid cooling unit. This unit does a great job on its own keeping the CPU cool, a slight overclock might even work, but you have to watch it. Under the cold plate cooling the CPU we find an Intel Core i7 9700K processor. A great CPU, 2nd from the top of its line sporting 8 cores running at 3.60Ghz with its max turbo frequency hitting 4.9Ghz with 12MB of cache. 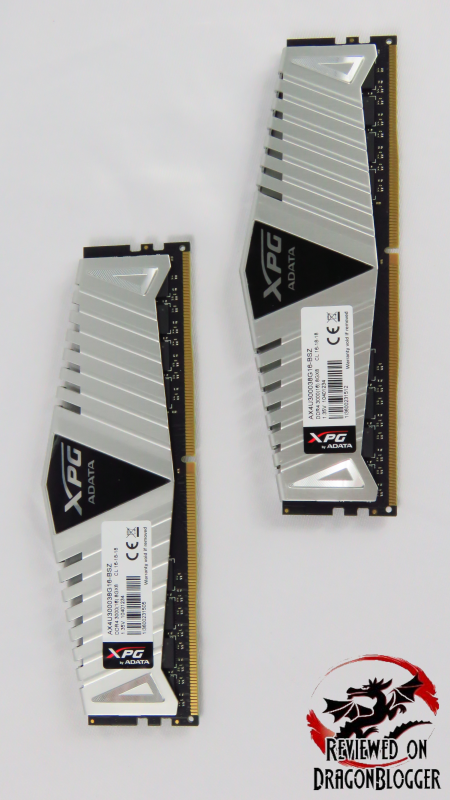 To the right of the CPU, we find 16gigs of Adata XPG ram, model number AX4U300038G16-BSZ 3000Mhz DDR4 ram. 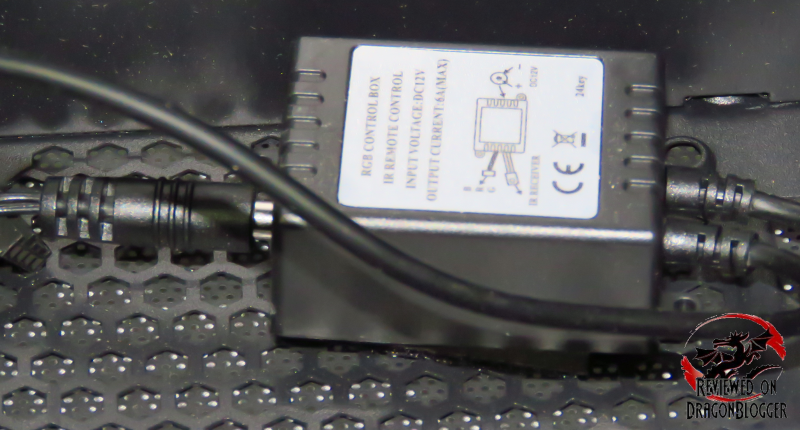 At the base of the system, next to the power supply, we find the RGB controller box. 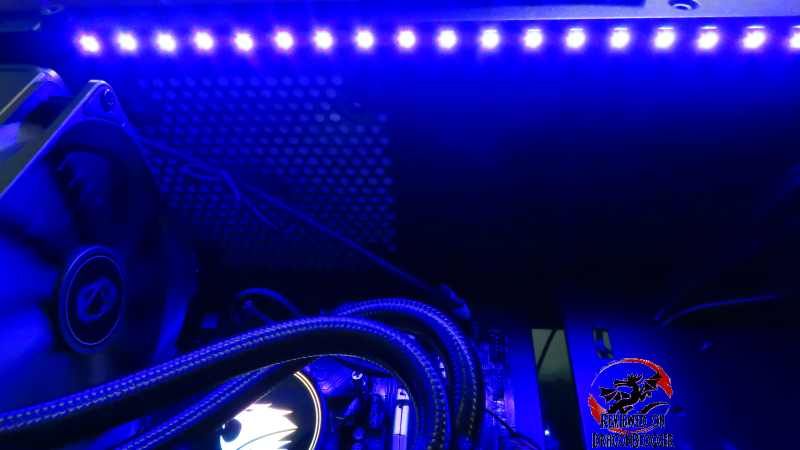 At the top of the system, we can see the RGB LED strip. 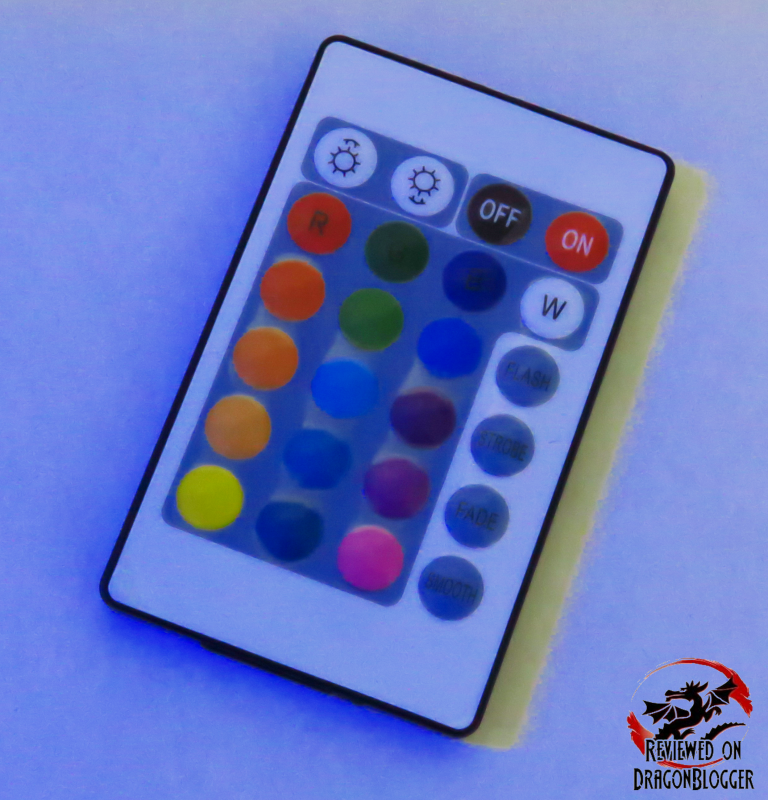 Its colors are controlled by this little remote control included in the package. The back of this system can be a little scary, with all the cables strung across shows 2 additional pieces of equipment. 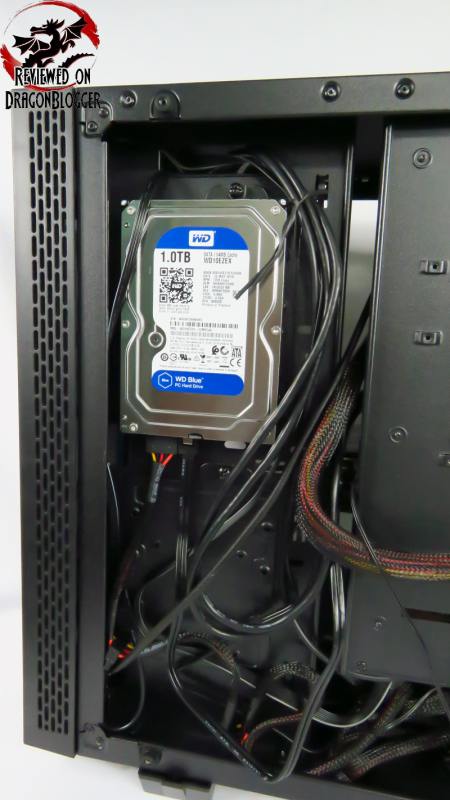 Top left-hand corner shows a 1TB Western Digital Blue drive, this drive is used as the storage drive. Not the fastest but it is a storage drive so it doesn’t need to be very fast, which is why it was left as the storage drive not the OS drive. 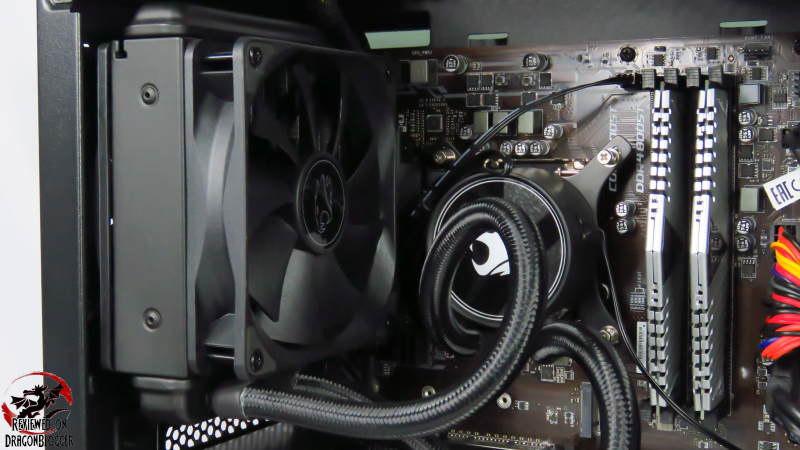 At the bottom right hand corner, we find the system is using a Thermaltake Smart Series 600Watt 80PLUS Gold power supply which does this system well. The top front of the system, we can see the case has 2 x USB 3.0 ports as well as a microphone and headphone jack, activity light and power light. The long strip to the right of the is the Reset and Power button. 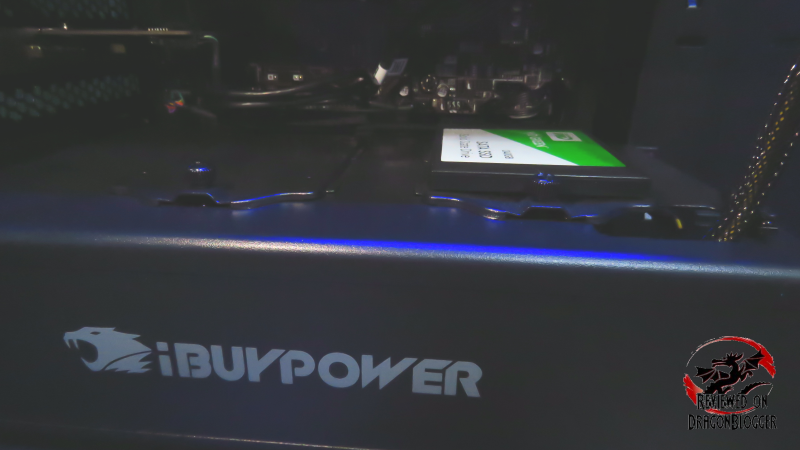 Zooming out a bit, we can see the curve at the front of the case and the iBUYPOWER Chimera trademark. 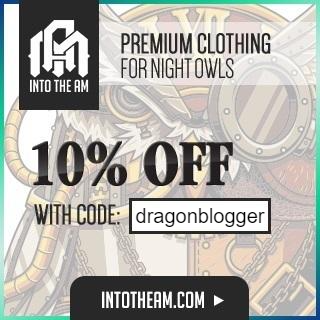 At the rear of the system, we can find the I/O. 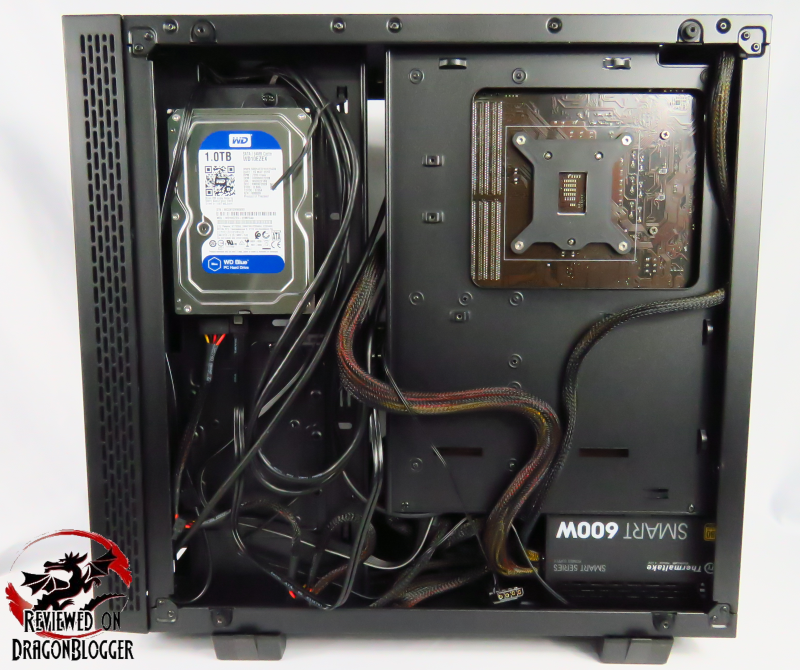 The motherboard has 2 x USB 2.0 ports as well as an old school PS/2 port a DVI and VGA connection as well as a Display Port connection. We can also see a USB type C connection as well as a USB C type A connection. We find 2 additional USB 3.0 ports as well as an ethernet port, which is an Intel i219-V connection the finally the Realtek ALC892 5.1 audio jacks. 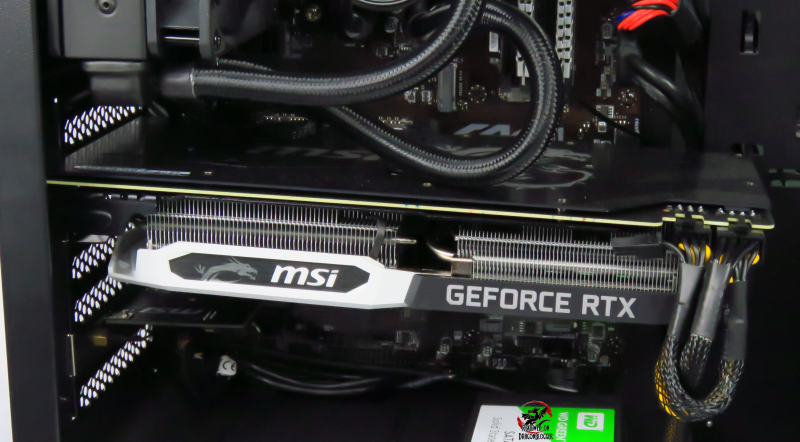 Below that we find the MSI Ventus Geforce RTX 2070 as well as the Intel Dual Band Wireless-AC 3168, both of which we already mention before and the power supply. 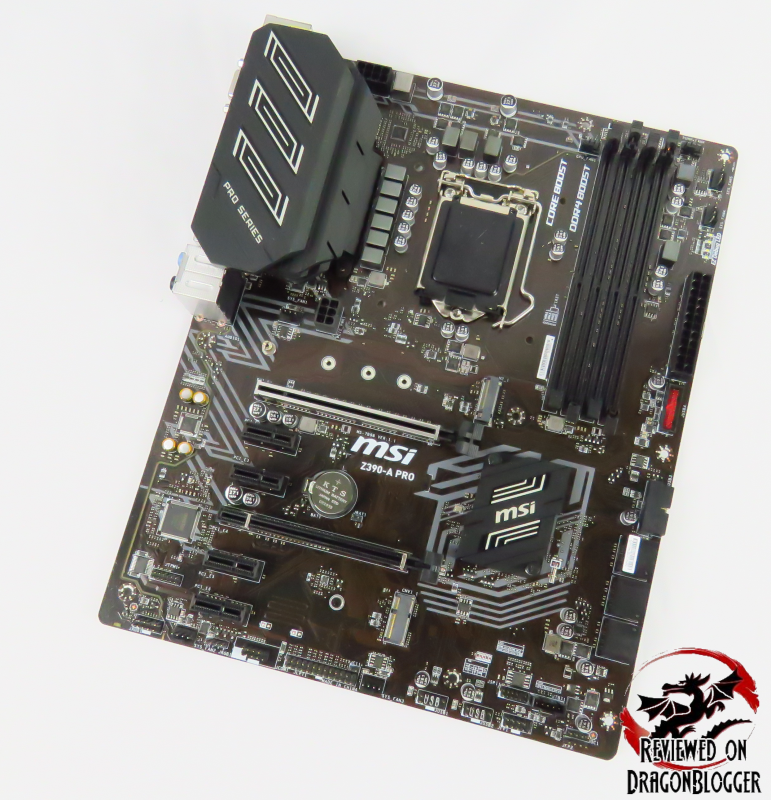 Holding the system together we find an MSI Z390-A PRO Gaming Motherboard. The board supports 8th and 9th Gen Intel 1151 socket processors and supports DDR4 RAM up to 4400Mhz. 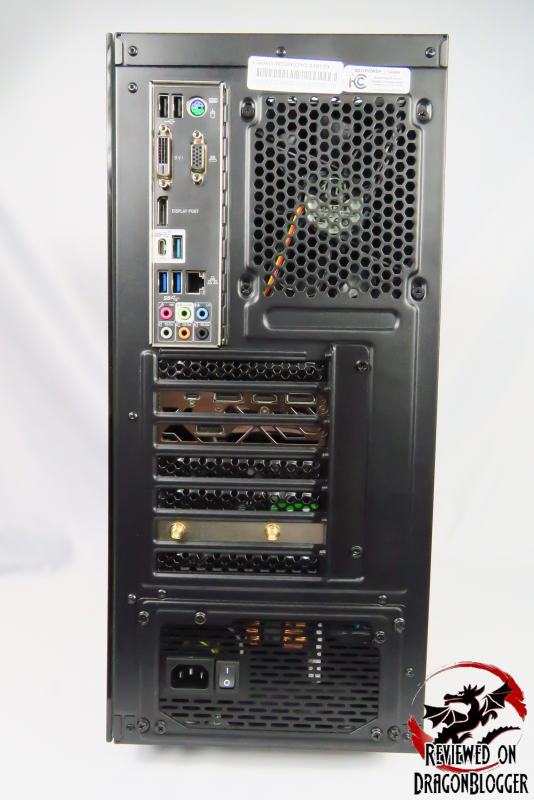 The board has support for a single M.2 drive, 2 x16 PCE-e Gen 3 slots supporting Crossfire, 4 x1 PCI-e slots, 6 SATA 3 ports, 4 x DIMM slots supporting up to 64Gigs of RAM, a TPM header and support for RAID 0, 1, 5 and 10. The system also comes with this keyboard. It is not a mechanical keyboard, it is a membrane type keyboard, cushy soft keyboard presses which I actually kind of miss, although I do love the clickies. 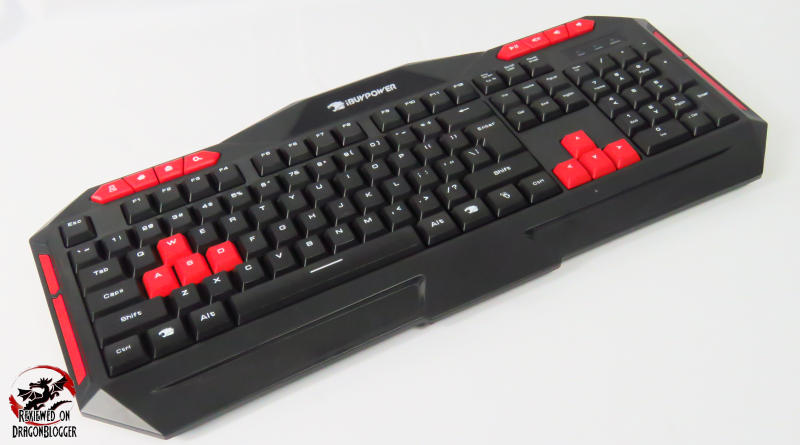 This is a modified Gamdias keyboard, a combo keyboard that also comes with a mouse. 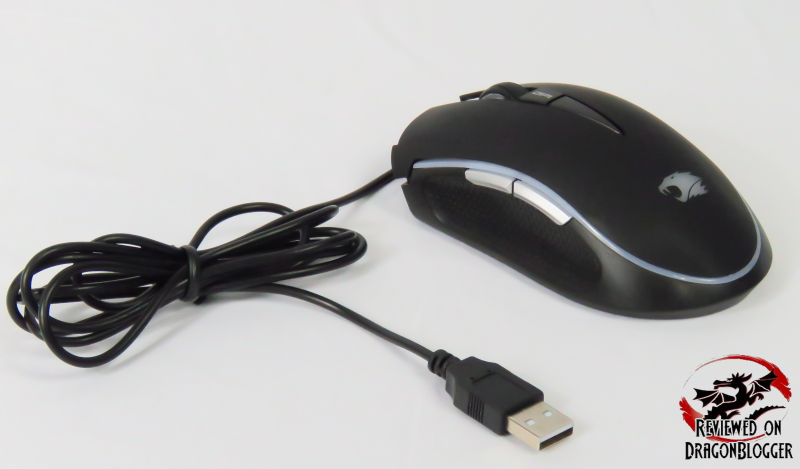 This is the mouse, it is actually very comfortable, a little on the small side but it offers a clickable scroll wheel, forward and back side buttons, a DPI selector switch and sides that are textured as to not slip from your hands up to a 3200 DPI. The keyboard shows it is an Aeres E1 and the mouse a Zeus E2. OK, now that we have gone through all the pieces in the system, lets get to our final chapter in this review, Is it worth it, Final Thoughts.